Home Katana Katana: The Ultimate Sword? Most people in the west have heard stories of the incredible cutting power and durability of the Katana, a symbol of Japan through two of its feudal periods. Some people can even tell about how their grandfather in World War II had the barrel of his rifle cut in half by a Japanese soldier with a Katana. Movies, anime, and video games put the sword front and center as something more than a melee weapon – it is simultaneously a warrior totem and the apex of swords. In many ways it is the image of the samurai, before all else. It has a fairly large cult following in the west. First, consider the form of the weapon. It is a curved, single-edged weapon that is very rigid – you can compare this to the European arming and longswords of the late Medieval period, which were predominantly double-edged, straight, and tempered to flex. The katana is made, first and foremost, to cut, and that job it does very well (I will talk about just how the sword is traditionally made another time). A casual trip through YouTube HEMA country will confirm this. A curved sword is generally superior to a straight sword for cutting because the curve concentrates more of the force of a blow into a smaller area where it contacts the target. So why did the Europeans choose to use mostly straight blades (I say mostly, because there were still plenty of curved weapons like battle axes and falchions)? Were their smiths inherently stupider than their Japanese counterparts? The answer is no. European swords were developed to meet the standards of a different context than what existed in Japan, with different resource availabilities (more on that in a future article). This context primarily rests on the types of armor used and how armor was worn, and how often it was worn, which was very different from what existed in Japan. Straight swords, like those used in Europe, were designed to be used against a variety of armors that negated most cuts, specifically mail (or chain mail). Armor like the gambeson (made of sheets of tightly quilted linen) was also very resistant to cuts and was widespread among the soldiery of Medieval Europe. A straight sword could, with a good thrust, part mail links or find the typical armor gaps at the legs, knees, armpits, elbows, and necks when plate armor came into greater use. It was also springy, so if it hit a resistant target the blade could flex and bounce back. Longswords used to also be gripped halfway through the blade to overcome the flex when a knight needed to thrust his needle-like point into an armor gap. Wait. The Japanese had armor too, right? Does that mean that their smiths were the ones missing the boat, making a weapon that would be ineffective against armor? Again, no. Japanese armor was very effective, but it was a rarity among the majority of the samurai class up to the mid Edo period due to its expense (Japan was very mineral poor, so iron was expensive in addition to the skill needed for armor crafting). Additionally, virtually nobody spent their time in armor unless they intended to be going into battle or were expecting a fight. Armor is not comfortable to wear for extended periods and is very hot, so most samurai spent time in simple clothes like kimonos. The Katana loses none of its effect when meeting a single layer of silk. Ultimately, the biggest misconception regarding both Europe and Japan when it comes to the purpose of the sword is assuming that it was the primary weapon of war. It was not. The primary weapons of war in both places were not swords for almost the entire soldiery, knights included. In Japan, the primary war weapons were the Naginata (spear or yari) and the bow and arrow. The spear, in a battle situation, is superior to a sword in almost every conceivable sense. It has longer reach, allowing you to more safely offend your enemy. Due to this reach it is also faster than a sword (contrary to popular belief or the implications of DnD, shorter weapons are not faster than longer ones) since you don’t have to move as far to hit your target. It also takes less skill to master, allowing a soldier to be more dangerous and effective with less training and experience. A ranged weapon like a bow, crossbow, or gun (and samurai did use guns in battle!) is even better, since you can offend your enemy with even less risk to yourself. In both contexts, the sword is a sidearm, intended to be used as a back-up or if a need arises for a blade. It is also much easier to carry than a spear. Like the revolver in the American West, it could be carried easily on the belt and put to use quickly, making it a good defense weapon (and even in the old west your rifle was likely to be your preferred weapon in a fight). The katana was worn in such a way that it could be quickly drawn and, in some forms of kenjutsu, used in the motion as the draw. So, in most contexts where the katana would be used, armor was not a factor, but good cutting ability would be beneficial, so the form still followed function, even thought that form has been enshrined with symbolism over the centuries. The katana was also, I should mention, not useless against armor – it just had more limited use because armor was effective against cuts. You can still give point effectively with a curved blade, especially one with such a modest curve. When I wrote my historical fantasy novel, Muramasa: Blood Drinker, I took this into account. There are ritualized duels, executions, and sudden fights involving the katana, but none of these were in the context of a battle where armored samurai would be present. The book takes place almost entirely within the civil course of samurai life where the katana was used as a quick and effective means of defense and attack, not as a primary weapon of battle. The katana was also a symbol of the Samurai class, showing to all who and who was not a member of the warrior caste when it was combined with a shorter blade – either a tanto (dagger) or a wakizashi (short sword) depending on the time period – called a daisho. In many contexts the katana was set aside upon entering somebody’s house as a sign of respect, but the shorter blade was kept, so that a samurai always walked armed and ready to defend himself or his liege. So, is the Katana the ultimate sword? Is it the ultimate weapon? No, but then again, nothing is. Of course, is any sword as aesthetically pleasing as the Katana? That’s a topic for another time. Thanks for reading. If this interests you, you can learn more about feudal Japan, weapons, and katana by reading my historical fiction book, Muramasa: Blood Drinker. 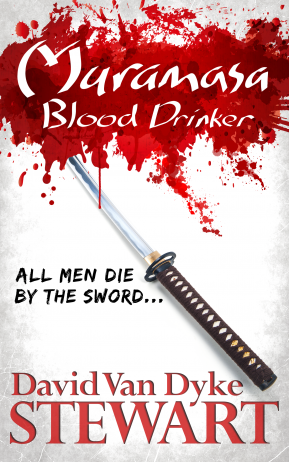 Feudal Japan, Japan, katana, Martial Arts, Masamune, Muramasa, Muramasa: Blood Drinker, sword. Bookmark.